Have you ever thanked God for shoes? Not shoe sales, now, but shoes. Every Sunday evening, about 100 Christians from the neighboring area would gather to worship. They met under a tin-roof lean-to that was set at the edge of a cornfield. They sat, when they did sit, on rough wood benches. The floor was dirt. The instruments were old. Some of the guitars didn't have all the strings. But they could worship! They made hell run for shelter when they got loose. One Sunday evening, the pastor asked if anyone had anything to share. A tall, willowy woman came to the front. She was plain-featured, but she was beautiful. "Oh, brothers and sisters, I love Jesus so much," she started. "Tell us, sister! Tell us!" the worshippers shouted back. "Oh," she said, "he is so good to me. I praise him all the time for how good he is to me. For three months, I prayed to the Lord for shoes. And look!" And at that the woman cocked up her leg so that we could see one foot. One very ordinary shoe covered it. "He gave me shoes. Hallelujah, he is so good." And the Ugandans clapped and yelled and shouted back, Hallelujah! I didn't. I was devastated. I sat there hollowed out, hammered down. In all my life I had not once prayed for shoes. And in all my life I had not once thanked God for the many, many shoes I had. I have to admit that I'm not where she's at yet. I want to get there, though. How about you? We need to bring a passion for God back into the center of our lives. 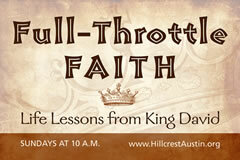 On Sunday mornings, we've been working through the biography of King David. When he began his reign at the age of 30, one of the very first things he did was to bring back the ark of the covenant. The ark was the little chest that once resided in the holiest part of the tabernacle. It was the symbol of God's reign. In 1 Samuel 6, the Philistines defeated Israel and captured the ark. But in 2 Samuel 6, some 60 years later, David's first priority as king was the return of the ark. What was he doing? He wanted God's authority at the center of his life and his nation. Join us this Sunday @ 10 and let's recommit to bring passion for God's reign back to the very core of our own lives!